I did a food photography shoot today, the subject? 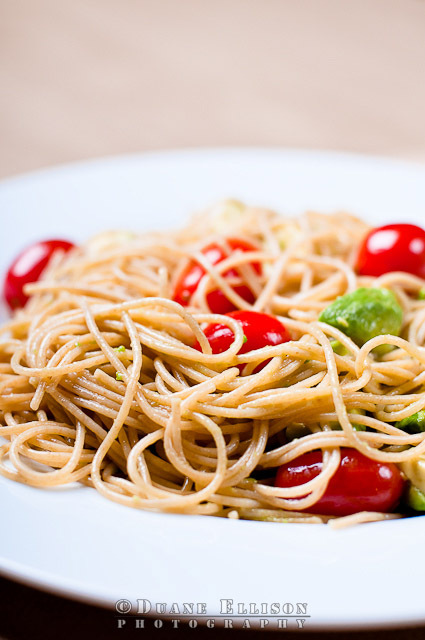 Pasta with fresh avocado, grape tomatoes lightly covered with extra virgin olive oil! The red grape tomatoes made a wonderful contrast to the image and the avocado rounded things out very nicely! The lighting setup was very simple with one Alien Bee AB800 on a c-stand with a Photoflex 22" Multi-Disk Circular Reflector on a light stand with a reflector arm for some fill. I used a combination of lens starting with the Nikon 50 1.4 AF-D and finishing out with the legacy Nikon 105 2.8 AF-D Macro lens. I've been having a lot of fun lately shooting various food and really trying to dial-in my lighting and equipment configuration to make the shots really pop!